New Winter 2018: Devoted nurses make a wonderful difference in the lives of their patients and the patients’ loved ones! 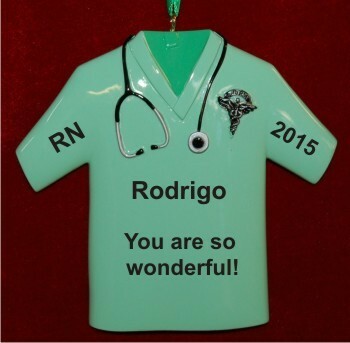 Show your appreciation for a caring professional with a nurse who really cares-male Christmas ornament personalized with his details and your warm message too. This personalized nursing ornament arrives with the information painted on by hand in a handsome font to look like the uniquely created gift it is. Let someone special know that they’ve made a difference in your life this holiday season with a personalized nursing gift that that will find an honored spot on his tree, the male nurse Christmas ornament personalized just for him.